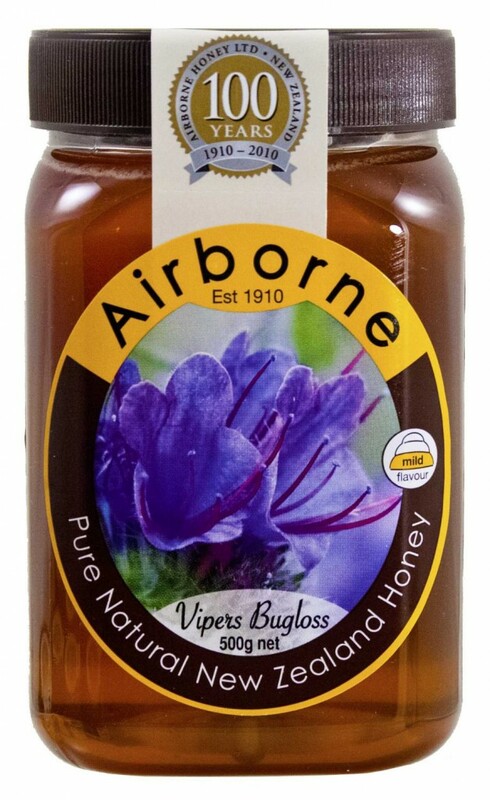 Viper’s Bugloss honey comes from Viper’s Bugloss flowers, also known as Echium vulgare, blueweed, blue thistle, blue devil, snake flower or snake’s tongue. It is a rather exotic native plan that makes lots of nectar and pollen and for this reason the flower is very much loved by the honey bees. Plus that it can be found till late September and offers the bees the possibility of gathering their necessary food for the winter. Viper’s bugloss is a plant that can be easily found because it’s not a demanding one, it has a lot of nectar and pollen, and bees like it. Unfortunately, the honey resulted is not that safe. – Etymology: Viper and the botanical name, Echium, is derived from Echis, a viper. The name was given by the elders because the plant was an expellent of poisons and venom, and cured the bites of a viper. Bugloss comes from the Greek Ox’s Tongue. The plant is covered with prickly hairs and the roughness and shape of the leaves resemble an ox’s tongue. – Other names: blueweed, blue thistle, blue devil, snake flower, grass-snake, snake’s tongue, snake’s bugloss, viper’s bugloss, viper’s grass, viper’s herb, blue bottle, wild Borage, bugloss, cat’s-tail, blue cat’s-tail, iron-weed, langdebeef, our Lord’s flannel or our saviour’s flannel. And there could be probably more. – Native to: Europe, western and central Asia. It has been introduced to North America and is naturalized in parts of the continent, even being listed as an invasive species in Washington, considered a Class B noxious weed. It is also considered noxious in Australia, New Zealand, Alberta, Manitoba, Québec, Nova Scotia, and parts of British Columbia. Its ability to survive in poor soils and its resistance to deer aid its rapid spread. It grows on walls, old quarries and gravel pits, and is common on calcareous soils. It seems to prefer poor soil and inattention and can grow up to nearly a meter in height. The flowers are in curved spikes, numerous, those of each spike pointing one way and closely wedged together. On they first open they are bright rose-colored, but then turn to a vibrant blue with contrasting red filaments. They reach 15–20 mm (0.59–0.79 in) in a branched spike, with all the stamens protruding. The flowers produce brilliant blue pollen (which makes them attractive to both polylectic bees, like honey bees and bumble bees, but also to some solitary oligolectic bees), but are scentless. They bloom from May till September. The corollas are irregularly tubular and funnel-shaped. A variety of this wild flower is occasionally found with white flowers. – The nectar is protected inside the flower, from vaporization (when it’s hot) or being flushing away (when it rains). This plant produces nectar throughout the day, unlike most plants which produce nectar for a short period of time. If the bees have a good access to Echium Vulgare, they can collect between 12-20 lbs of nectar a day. The plant continues to bloom throughout drought periods. The concentration of sugars in the nectar varies, from 22.6 to 48.3% depending on the quality of the soil, and not on the amount of rain. Which is, again, not like in the other types of nectar. 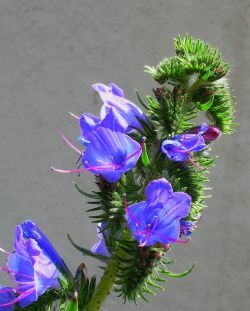 According to TheMelissaGarden.com, viper’s bugloss may produce 300 to 1000 pounds of honey per acre. – The pollen: Viper’s bugloss is known as a major pollen crop as well, producing as much as 500 to 2000 pounds per acre of dark blue pollen. Beside honey bees, the plant is known to attract at least 50 species of pollinators in Canada alone, including bumble bees, sweat bees, mason bees (Hoplitis), at least eight species of butterfly, and the ruby-throated hummingbird (see “The Biology of Canadian Weeds” Klemow et al. 2001). – The fruit consists of four small nutlets. – The leaves are rough, hairy, lanceolated. – The roots are biennial (a monocarpic perennial plant) and descend to a great depth in the loose soil in which the plant generally grows. – It was thought to be a useful antidote to snakebite based on the logic of 14th century herbalist’s Doctrine of Signatures that states that the appearance of a plant indicates its use to humanity. Culpeper’s Complete Herbal (circa 17th century) describes Viper’s as follows: “It is a most gallant herb of the Sun; it is a pity it is no more in use than it is. It is an especial remedy against the biting of the Viper, and all other venomous beasts, or serpents; as also against poison, or poisonous herbs. – Diuretic, demulcent and pectoral. – The leaves, especially those growing near the root, make a good cordial on infusion, which operates by perspiration and alleviates fevers, headaches and nervous complaints, relieving inflammatory pains. The infusion is made of 1 oz. of the dried leaves to a pint of boiling water, and is given in wineglassful to teacupful doses, as required. – A decoction of the seeds in wine, ‘comforts the heart and drives away melancholy.’ – as it is mentioned by the old writers. – The plant contains potassium, calcium, tannins, alkaloids, allantoin, resins, mucilage, choline – therefore it is a good antibiotic, antiseptic, astringent, expectorant, emollient, cleanser, diuretic, healing action. – Used in enteritis, diarrhea, dysentery as infusion of viper’s bugloss prepared as follows: Place 20 g dried herb in 1 liter of boiling water, leave it to infuse for 15 minutes and filter. The infusion is recommended for internal use taken by 3 cups /day. – Helps in pharyngitis and stomatitis if gargled with the infusion. – Treals wounds and furunculosis – Apply compresses with the infusion. – Eases cough if treated with an infusion of grass-snake because it has emollient and anti-inflammatory. – Helps in treating staph and Enterobacter because it has a high antibiotic action. – Used in respiratory infections . The plant is used as an infusion, as it has good emollient, expectorant and antibiotic properties. – Due to the content of allantoin the plant was found to have anticancer effect. Viper’s Bugloss (Echium vulgare) honey is also known as Borage honey or Blue Borage honey, though it is NOT made from the borage flowers (aka starflower, Borago officinalis). This is a misfortune mistake, as the plants are different in composition, though belonging to the same Boraginaceae family. • honey made from Borage (Borago officinalis), aka starflower, a different plant, commercially grown and used for seed oil, a beautiful annual herb with edible leaves. In UK they bloom from June to September, and make perfect blue (or white) flowers with five narrow, triangular-pointed petals. This flowers contain non-toxic pyrrolizidine alkaloid (PA) thesinine, have a sweet honey-like taste and is one of the few truly blue-colored edible substances, often used to decorate desserts. • honey from Purple Viper’s Bugloss (Echium plantagineu), popularly known in Australia as Patterson’s Curse. Also considered an invasive weed, this plant has a high concentration of pyrrolizidine alkaloids, and considered to be poisonous to grazing livestock, especially those with simple digestive systems, like horses. The toxins are cumulative in the liver, and death results from too much Paterson’s curse in the diet. In Honey Plants of North America, Lovell describes the honey as light amber (yellow gold) with a good flavor and body. It has a light clean taste, a floral bouquet and lemon characteristics. Because the honey is high in fructose, it is slow to crystallize and may remain liquid for 9 to 15 months. It is delicious in tea or coffee and compliments a strong cheese such as blue or Roquefort. As for preferences, men are more found of it, if compared to women. Viper’s bugloss is often one of the many blossoms contributing to multifloral honeys from around the world. A monofloral honey it it is found more in New Zealand. Mainly from the Southern island where it grows wild in the dry mountain valleys and mountain sides during the summer months. This pure environment is ideal because of the low risk of pesticide and chemical contamination. !Toxic compounds: There are trace amounts of hepatotoxic pyrrolizidine alkaloids found in the pollen of Echium vulgare (viper’s bugloss), just as in pollen of Echium plantagineum, Senecio jacobaea, S.ovatus, and Eupatorium cannabinum (as reported by Boppre et al., 2008 and Klemow et al., 2011). Recently, the European Food Safety Authority confirmed their presence in all Boraginaceae (all genera), Asteraceae (tribes Senecioneae and Eupatorieae) and Fabaceae (genus Crotalaria). Read more about their conclusion regarding the presence of PA in honey in Scientific Opinion on Pyrrolizidine alkaloids in food and feed. Pyrrolizidine alkaloids are produced by plants as a defense mechanism against insect herbivores. 3% of the world’s flowering plants contain pyrrolizidine alkaloids. Besides honey, pyrrolizidine alkaloids can also be found in grains, milk, offal and eggs. Recently Kempf et al. (2010) reviewed the importance of PA’s (pyrrolizidine alkaloids) for human nutrition. The quantities found in Echium, Senecio, Eupatrium and Phalaenopsis pollen varied between 0.8 and 14 mg/g. From all Pyrrolizidine alkaloids, the unsaturated pyrrolizidine alkaloids are damaging to the liver (hepatotoxic). They are tumorigenic, can cause hepatic veno-occlusive disease and liver cancer. The ones found in viper’s bugloss honey are hepatotoxic, and so we should be very careful in eating this type of honey, and keep it to a smaller quantity. Viper’s bugloss honey should be eaten only in small quantities, not on a regular basis, and totally avoided by pregnant, lactating women and infants or by persons with compromised liver function. In Middle and Northern Europe these pollens are not among the main pollen gathered by bees, however in Southern Europe, the two Echium plants (Echium vulgare and Echium plantagineum) are more diffused and are gathered by bees in larger amounts. However, till 2015, there have been no specific standards regarding pyrrolizidine alkaloids contained in honey for consumption. Which is why The New Zealand Food Safety Association found there was no appreciable risk to New Zealand consumers of Viper’s Bugloss, given the level of exposure in the New Zealand diet and therefore no standards have been set for a daily limiting ingestion of Viper’s Bugloss honey. You can find more here: New Zealand’s Food Safety Risk Management Framework. · Toxic honey. A list of 4 toxic honeys we should stay away from. “Echium vulgare” featured picture credit Hans Kylberg, published under CC via flickr.com. Hi Laura, thanks for sharing this though that was really lots of information to absorb. 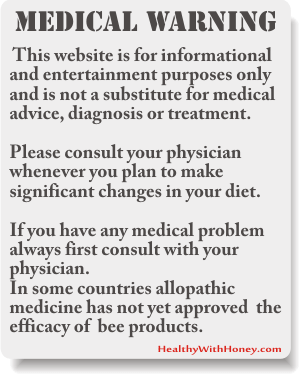 Just wondering you were saying that the Viper’s bugloss honey should be eaten in small quantities. So how often or how much could I eat per day? 1 teaspoon? 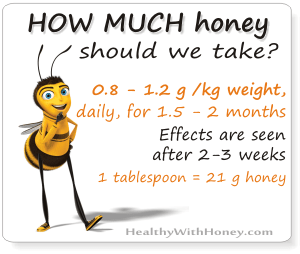 Therapeutically, honey is taken 1 g per kg body weight per day. And we exclude from here manuka honey and other potentially toxic honeys like this one, from viper’s bugloss. 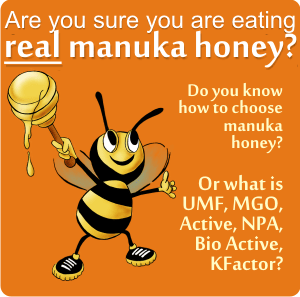 As for manuka honey there are not sufficient trials to make sure is not toxic if taken internally. 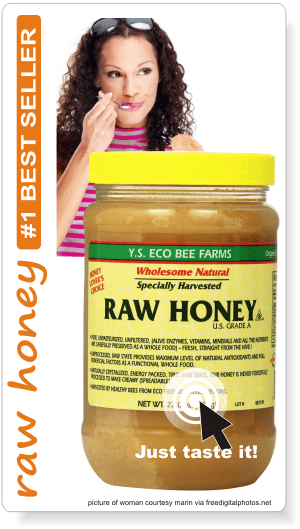 So, a regular consumption of raw honey means like 1 tablespoon taken three times a day. We usually don’t take that much, we put a teaspoon in our coffee or tea, in the morning and probably in the afternoon. But on a regular daily basis, our body can benefit a lot. Viper’s bugloss can be eaten occasionally, or used in a dish, 2 teaspoons per day are ok, but not for a daily consumption. Otherwise, it is not exactly poison! Apitherapy does use it, but for short periods of time. Hello! This is my first time here and I have to admit you are doing a wonderful job. As a tea lover I am always looking for a new type of honey to sweeten my tea with. 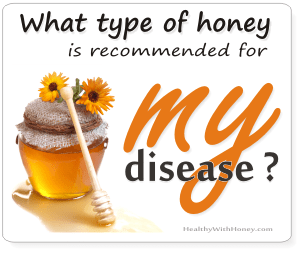 I had no idea there are so many different kinds of tea out there and that honey could help treat so many different conditions. It’s truly a wonder food! Thank you for this info and keep up the great work. I will be visiting here more often! Just like your teas! A wonder. Teas use the dried flowers, and honey uses the the flowers’ nectar! The medicine of nature. It is a good idea to sweeten your tea with honey, because it potentiates the herb’s properties. Imagine drinking linden tea with linden honey. The effect is doubled.